Are you a gun owner who wants to protect your firearms from unauthorized access or theft AND still be able to access it in a hurry? If so, then you should consider biometric technology. Biometric use a unique physical characteristic, such as a fingerprint or facial recognition, to allow automatic access. In the case of safes this usually means fingerprints, facial recognition is generally too expensive for civilian applications. Instead of using a key, code or combination to open the safe you enter your fingerprint via a built in reader, the safe compares it to stored fingerprints of authorized users and unlocks the door. The benefits of biometrics include not needing to find or fumble with a key, remember a combination and general speed of access. The safe can literally be opened in seconds. But not all biometric safes are equal, so let us help you determine what you should look for when selection you own high tech gun safe. technology is only as good as the platform on which it runs AND the user on the other end. It is important that you select a safe with an easy to use fingerprint reader, one which is not too sensitive or requires a complicated series of steps to operate. Plus, as not everyone is a computer programmer, it should also be easy to set up. any machine can malfunction or break so it is important to select a safe with a secondary means of access, such as a key or combination. It is recommended you select a model with at least one non-electronic means of access for use when the power supply is compromised. is feature is a must have, without it only one fingerprint will be able to be used to open the door. Having multiple users allows other adults in your household to access your firearms, but even if you are the only user a second print may be necessary should you cut or injury your primary finger- something which can make it difficult for the scanner to read the print properly. The biometric safe market is growing at a rapid pace but we have reviewed some of the most popular models currently available. By comparing their features against those we find desirable you will have a baseline against which others can be prepared. If you one of these models interests you be sure to use the provide link to check current availability and price via Amazon. 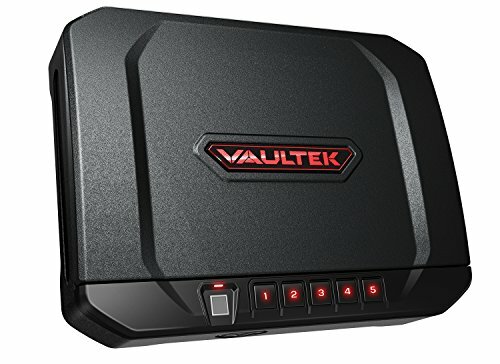 Gunvault is a pioneer in biometric technology and this safe takes advantage of their over 2 decades of experience. By pairing their proven technology with a high performance algorithm they have developed a system which provided fast recognition and a very low false rejection rate. For those looking for the ability to allow multiple user access the onboard computer is capable of storing 120 individual prints, or over 12 million user selected access codes. Should an error occur or the power source be unavailable access can also be obtained via a mechanical key lock. Exterior dimensions of 12″x10.5″3.5″ means this safe is well suited for the car, bedside or even inside a drawer. The supplied 4 ft. Security cable allows secure attachment to any solid object at home or on the go. Easy to program, even for multiple users. Audio alert can be silenced for stealth. 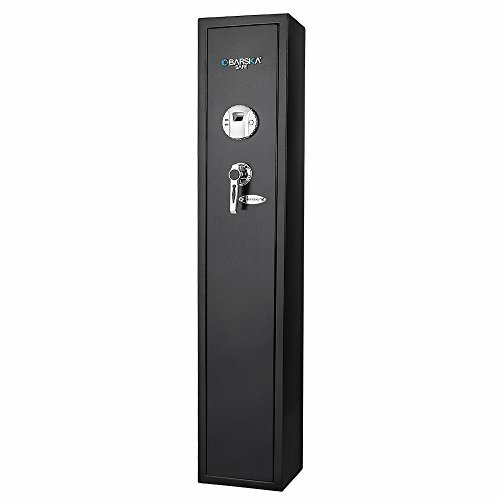 The is one of the few economical biometric safe available capable of accommodating long guns. With removable barrel supports and a removable shelf you can configure the exterior to meet personal need. You can finally provide security for your rifles and shotguns while still accessing them quickly in an emergency. The biometric system has the ability to remember 120 individual prints and includes a key operated back up. The power is supplied by 4 AA batteries but an auxiliary external battery pack is also available, prefect for those times you forget to change the batteries but still need access. A mechanical key operated lock is also included. 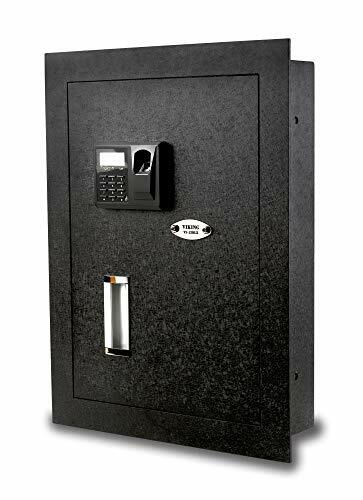 At only 66 pounds this safe is a nice alternative for those looking for biometric long gun storage without the cost or size associated with other models. External auxiliary power allows use when battery is low. Size well suited for apartment or small house without space for conventional safe. Front panel must be removed to access key lock. AR style rifles may not fit properly when magazines are inserted. Unlike the others safes we’ve reviewed Viking’s Security Safe is an in-wall design, meaning it permanently mounts between the studs of the wall. While this type of safe is considered very secure they are typically operated via a mechanical combination, not well suited if home defense is a concern. Now you have the added security and concealment of a wall safe combined with the quick access of biometrics. The advanced print reader is a single finger design capable of storing 32 individual prints-enough for you and several family members or co-workers. The adjacent LCD screen and keypad provide up to date status and battery level information as well as a second means of entry. The unit will continue to retain stored prints even if the batteries are removed and the key operated lock allows access when power is unavailable. Multiple means of access even if power is lost. LCD screen provided current status and power levels. Interior light to assist in finding items in the dark. 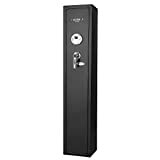 Thick door and heavy lock provides extra security put reduces storage capacity. Keypad is not mounted flush with exterior, concealment behind picture etc. may be difficult. The VT20i is not only one of the fastest safes in terms of access it is also one of the most technological advanced models on the market. By combining biometrics and a spring operated door you can have almost instant access in an emergency. In addition to the biometric system there are three other means of entry – keypad, mechanical key lock and even a smartphone app. The smartphone app not only allows the ability to unlock the safe remotely it also provide up to the minute status reports, power levels and alerts if unsuccessful access is attempted. The onboard memory has a limit of 20 prints, but allows over 40,000 keypad combinations. If accessing during reduced visibility you will find that not only is there an interior light but also a proximity activated backlit for the keypad. Because all of these features will require a dependable power source it comes complete with a rechargeable lithium-ion power pack and charging device. Designed for travel as well as bedside use the unit is also California DOJ and TSA certified. Smartphone app will appeal to tech savvy users. California DOJ & TSA certified. 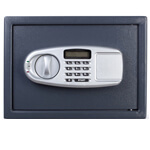 Strong, time proven design to provide top notch security even without the technical advances. Some users may find the technology difficult to master. Small size makes this a “one gun & magazine” option, large frame revolvers may not fit. Buying a safe is an important aspect of keeping your firearms safe from theft or unauthorized use, but it can be a complication process. 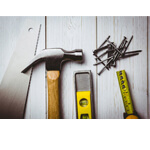 Hopefully we have been able to help you with these tips and suggests.